We had such a good response for the Saturday Beginners Cape Breton Step Dance workshop in November we’ve decided to offer it again this spring. This workshop will be geared towards total beginners, but returning students who want a refresher are always welcome. Come on out and dance! Congratulations to my husband, Gaelic scholar, for an excellent review of his latest book by Roddy Maclean. Read the full review here. 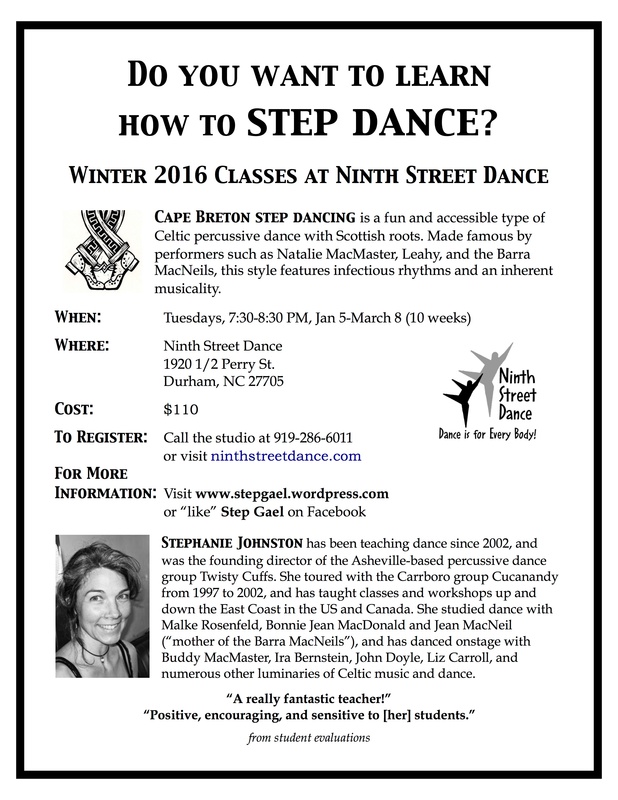 Winter Step Dancing Classes in Durham! We had such a good turnout for the Saturday Beginner’s workshop in November that Ninth Street Dance in Durham has asked me to teach a Beginner Cape Breton step dancing class for their 2016 Winter session. It’s a lovely studio with big windows and a great floor, and I’m please and excited to be added to their schedule. Classes will run for ten weeks (Jan. 5th to March 8th) on Tuesday nights, 7:30-8:30. This session will be geared towards total beginners, but dancers from my previous classes are always welcome back. We will work on variations of the basic reel step, as well as a few other steps I haven’t taught in the Triangle area before. Unfortunately, I won’t be able to offer an intermediate session this winter, but I will keep trying to work another class in for those folks who want to continue. For registration and more class information, please visit the Ninth Street Dance website. This is an excellent volume for anyone interested in the experience of Highlanders in the New World, written by my favorite Celtic scholar! 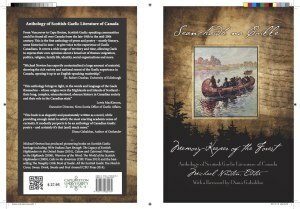 These are but a few of the memories preserved in the new volume Seanchaidh na Coille / Memory-Keeper of the Forest, the first anthology of prose and poetry composed by Highland immigrants and their descendants in their native language – Scottish Gaelic – about their experiences and perspectives in a new world. This fall, I’ll be offering two levels of Cape Breton step dance classes at the Carrboro ArtsCenter, Beginner and Intermediate. Both classes will be held on Thursday nights, starting September 17th. For more information and registration, please visit the ArtsCenter website. Step-shuffle-hop into the New Year! What better way to chase the winter doldrums away than Cape Breton step dancing? It’s fun, it’s aerobic, it’s done by exceptionally interesting people, and classes are starting up again in February! The new session at the Carrboro ArtsCenter will be geared towards beginners and those who would like to spend more time getting comfortable with the basics. We will meet on Thursday nights, 6:15-7:15, for six weeks starting February 5th. For more information on the class or how to register, please visit the ArtsCenter website. For those who are ready to move on to the next level, I will be offering a six-week Advanced Beginner session starting in April. Stay posted for more details! My two year-old daughter and I were recently invited to Nutcracker dress-up-and-dance playdate. Brilliant! 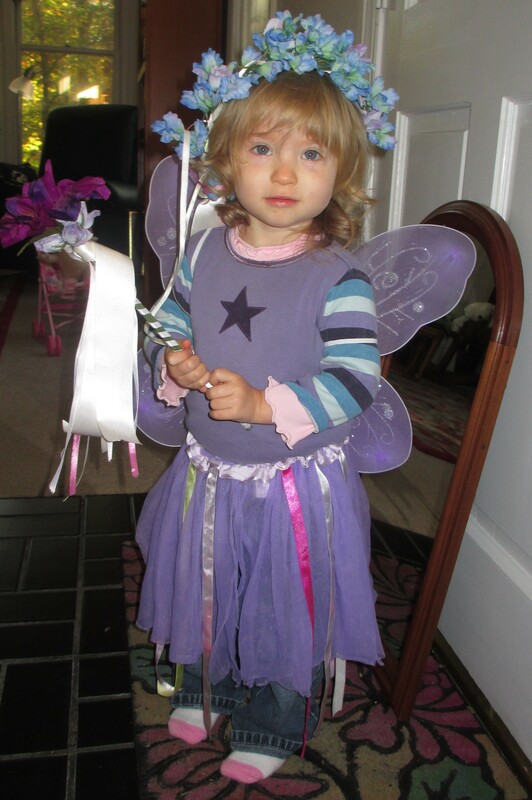 Róisín LOVES to dance, and we weren’t quite ready to retire the fairy queen costume I’d made her for Halloween. And I was enthusiastic for other reasons. When I was a little girl, I listened to the Nutcracker and other Russian ballet suits obsessively, making up stories and choreographing dances in my head. The music is so dramatic and evocative that I still find it hard not to get excited and want to leap/slink/prance around when it’s playing on the stereo. Imagine how thrilled I was in fifth grade when I finally got the see the Nutcracker onstage! I devoured books about dancing, I dressed up in old crinolines from the 1950s and pretended they were tutus, I daydreamed endlessly about performing onstage. But then I took an actual ballet class. Ballerinas (or so I thought at the time) are petite and flexible, with silky blond hair, dainty feet, and no curves whatsoever. I was big for my age, chubby, and could barely touch my toes. I felt like an elephant towering over the other girls at the barre, and every time we had to glide or leap across the room one at a time I wanted to curl up in a little ball of shame. I don’t know how many weeks I lasted before I dropped out, but I knew I would never be ballerina material. I continued to daydream about dancing, and to see choreography in my head when I listened to music, but I became more and more firmly convinced that there was a huge chasm between dancers and non-dancers, and that I was doomed to live forever on the non-dancer side. Even though I got involved in theater productions that often involved bits of dancing, even though I learned how to do various kinds of social and folk dancing fairly well, I still thought of myself as a klutz who would always be on the outside looking in. As I got older, I realized there was other kinds of dancing that I might like better than ballet. I started playing Celtic music in high school, and had fantasies of learning to step dance. But at that time I had no idea there was any option besides Irish competition-style dancing, which also only seemed to be done successfully by the skinny and highly flexible. Then I saw Wendy MacIsaac perform. For those of you not familiar with Wendy, she’s a great fiddler, but also a wonderful Cape Breton step dancer. “Wow,” I thought, “that looks like something I could actually learn how to do!” No leaps, no high kicks, no fancy shoes, just rhythm and musicality. I wasn’t sure how I’d manage to learn, since I didn’t have the means to go to Cape Breton, and North Carolina wasn’t exactly a hotbed of Cape Breton culture, but when the student is ready… Within a year, I was playing full-time in a band (Cucanandy) with Malke Rosenfeld, percussive dancer extraordinaire, who is not only a wonderful performer, but a gifted and generous teacher. She fed me bits and pieces of technique between rehearsals and gigs, and motivated me to practice with the prospect of dancing with her onstage. After Cucanandy disbanded in 2002, I began teaching dance classes in Asheville, NC, and after just a few years had started a semi-professional performance group with some of my incredible students. We called ourselves Twisty Cuffs, and danced at all kinds of events around the region. As much as I love to teach and dance with other folks, I think the most rewarding part of that experience was getting to finally choreograph for a group, finding a way to take my excitement about a piece of music and put it into motion. As I watch my daughter stomp, bop, turn, and shake around the house, I pray that I will be able to support her in finding a way to keep that joy and love of movement alive. I pray that poor self-esteem, insecurity about her body, and narrow-mindedness will never trip her up the way it did me. And I thank the universe that I finally found an outlet for my own passion about dance. Wow, What a Turnout at Gaelic Day! Having moved to the Triangle fairly recently from Nova Scotia, I’ve been trying to figure out a way to connect with other Celtoids in the area, especially singers. It’s usually pretty easy to find Irish musicians and dancers in this part of the US, but not so easy to find folks who know or care about the traditions of Scotland and Cape Breton (other than Highland dance and piping). So when I spearheaded a Gaelic music, song, and dance event at Johnny’s in Carrboro last Saturday, I had no idea if there would be much interest. Boy, was there ever! We had a huge crowd show up and I couldn’t be happier with the enthusiasm and participation from the community! We started off the evening with standing-room-only attendance at the Gaelic sing-along. The whole group joined in on the choruses of traditional songs led by Tom Terry, Michael Newton, and me, including “An Fhideag Airgid “(“The Silver Whistle”), which was recently featured on the hit TV series Outlander. Next, my husband, Michael (AKA, Dr. Newton, PhD in Celtic Studies from Edinburgh University), taught the group a collection of Gaelic phrases, from the oh-so-polite “Ciamar a tha thu?” (“How are you?”) to the decidedly naughty “Gun gabh am Fear Mór thu!” (“May the Big Man – the Devil – take you!”). 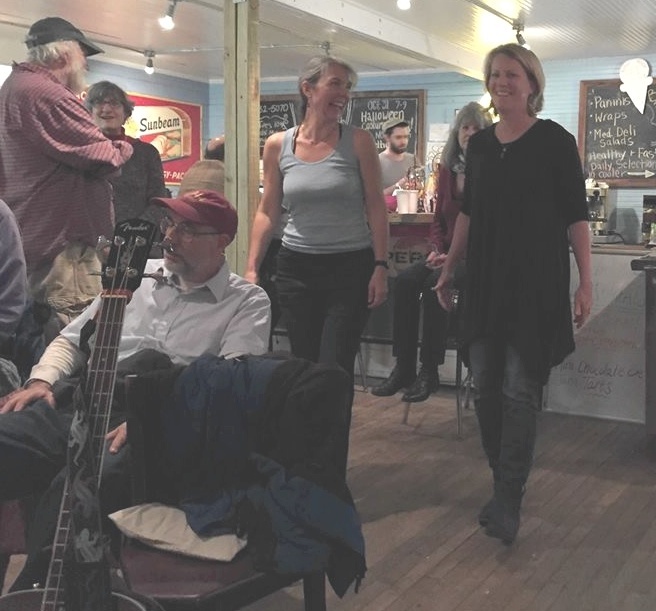 Then Tyler Johnson, Alison Arnold, Trish Hornick, and many friends pulled out their instruments for the session and the place really got lively! As much as I love a good Irish session, it was really fun to hear a big group playing mostly Scottish and Cape Breton sets featuring waltzes, strathspeys, reels, jigs, hornpipes, and probably other tunes that I would have kept track of if I hadn’t been stuffing my face with delicious scones and clotted cream from Johnny’s. In spite of the crowded quarters, a number of folks got up to do some steps, including an Apple Chill clogger and a few of my students. It’s always great to have the opportunity to dance to live music! Many thanks to all the people who made this wonderful night possible! I’m excited to announce the upcoming convergence of two of my favorite things: Gaelic culture and Johnny’s Gone Fishing, the iconic Carrboro coffeehouse! On November 1st, which is the approximate start of the Celtic New Year, Johnny’s will be hosting a celebration of Gaelic music, language and dance. I’ll be starting things off with a Gaelic song session: a free mini-workshop for anyone who’d like to try some Gaelic singing. We’ll learn the choruses to a few simple work songs, and I’ll stick around and chat with anyone who’s interested in getting more involved with Gaelic singing in the Triangle. Next will be a session with Dr. Michael Newton, who will teach participants short Gaelic phrases, some of which will be taken from his latest book, The Naughty Little Book of Gaelic: All the Scottish Gaelic You Need to Curse, Swear, Drink, Smoke, and Fool Around. Even Alex Salmond, the Scottish Prime Minister, owns a copy, and Diana Gabaldon, author of the best-selling Outlander series, has been tweeting about what a great resource it is! We’ll round off the night with a session of Scottish and Cape Breton music, led by Alison Arnold (of the NCSU Irish Session), Patricia Hornick, and Tyler Johnson, author of Tales from the Red Book of Tunes. I will give a Cape Breton dance demo, and I’m hoping a few other dancers may show up to join in with their own steps. Bring an instrument and come play some tunes! The festivities will start around 5:00 pm, and there will be lots of yummy food and drinks available, including the ethnically unrelated but still delicious Capp’s APizza truck. Hope to see you there! 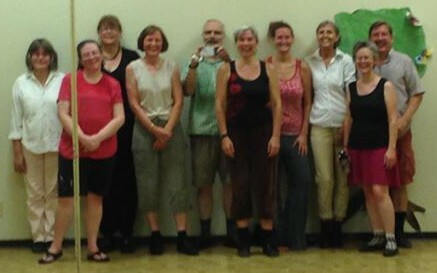 We’ll be starting an eight-week fall session of Cape Breton step dance classes on September 10th at the Carrboro ArtsCenter, on Wednesdays from 6:15 to 7:15 pm. This class is open to total beginners, but returning students are very welcome. Students should wear hard-soled shoes (without taps) and comfortable clothing. There’s more information about this class, including registration details, on the ArtsCenter website. I look forward to seeing you! Some of the wonderful Cape Breton dance students I worked with in the summer session at the ArtsCenter.